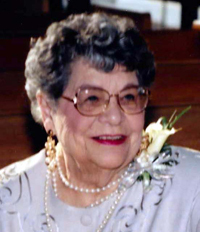 Alma Catherine Abbas passed away on Jan. 25, 2013. She was 42 days shy of her 96th birthday and led a rich, full life. She spent her last seven years living in Hailey, Idaho, just a few blocks away from her daughter, Janet Lombardo. Before moving to Hailey, Alma and her late husband, Ray, spent their winters in south Texas and summers in Whittemore, Iowa, where most of Alma’s siblings resided. Alma had three brothers and two sisters and was the second oldest. She is survived by her younger sister, Coletta, her son, Jim, and daughter, Janet. She had two grandchildren, one step-grandchild and one great-grandchild. Alma loved taking trips to Mexico with Janet and Janet’s husband, Gene, and did so once each year until 2012 when she could no longer travel. Alma was always ready for adventure, was quick witted, laughing at and telling a good joke at every opportunity. She was a sweet lady and everyone who knew her appreciated her smiling, mellow personality. Besides raising two children, Alma worked as a nurse during her younger days and was, of course, a part of the Greatest Generation, people who grew up during the Depression and sacrificed throughout World War II. We are all sad that she will not be with us any longer, but glad that she will be joining Ray, the love of her life, to resume their lifelong partnership. There will be a memorial service held this summer to honor Alma in Whittemore, Iowa. Cremation was under the care of Wood River Chapel. Friends are welcome to share photos and memories and light a candle at www.woodriverchapel.com.